The American Film Market commences tomorrow, with a week of screenings and activities in Santa Monica, California. 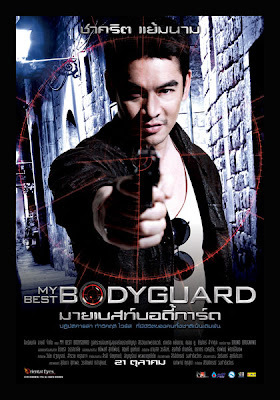 As detailed earlier, screenings include Bitter/Sweet, My Best Bodyguard and The Red Eagle, and there will be further ceremonies and announcements with regards to the Thai film industry. The Department of Export Promotion, Ministry of Commerce, announces the formation and launch of "Thailand the Film Innovation" to emphasize the Thai film and entertainment industry during the American Film Market, November 3-10, 2010. Her Royal Highness Princess Ubolratana Rajakanya Sirivadhana Barnavadi of the Kingdom of Thailand will preside over the Thai Film and Entertainment Presentation at Thai Night on November 3 to start this year's 2010 American Film Market. Invited attendees from the motion-picture industry will also be welcomed with an address by the Minister of Commerce Mrs. Porntiva Nakasai and followed by special performances planned and premiere showing of “VTR Thailand the Film Innovation” created for the occasion. Thailand is staging this event to welcome the film industry to the Kingdom of Thailand as innovative and sought-after destination for business and leisure, having recently passed tax incentives and other measures to stimulate film production by including a full value-added tax refund in addition to an income tax exemption for foreign actors. Over many years, the Thai film and entertainment industry has kept pace with its motion picture contemporaries around the world. The Thai film industry strengths are widely known and is the hub of Asia film location production, hosting many foreign and local productions, all at significant cost savings to many locations. Last year alone, 496 foreign films ranging from features to TV series, commercials and music videos were created and filmed in Thailand. Thailand features exotic locations, from mountains to oceans, unique tropical forests, plus traditional and modern buildings in both urban and rural settings with companies that devote significant resources to the newest technology, advanced animation and computer graphics, alongside experienced and friendly personnel. The Kingdom of Thailand is the perfect travel destination and provides the greatest cost-efficient production business location.